Bruce is back! You might remember him from my last-minute-addition to my tag collection…and many of you asked for him to be back with Copics. So here we go with a Stamp Masking Technique Refresh this week! Stamp Masking isn’t all that hard! Bruce has a huge pile of mail he’s been sorting through, looking for one special heart. Is it yours? In the video I show you some quick ways to mask by just placing sticky notes – no need for fussy cutting or fancy tools! Enjoy the video below, or click HERE to watch in HD on YouTube. Despite this looking like a lot of work – I was done, start to finish, stamp masking and coloring, in well under an hour. It’s not so tough if you plan it out right! PS – I’m in CHA-recovery mode. I posted a few of my photos and a few little tidbits HERE! Stamp masking doesn’t have to be daunting – did this post help you to think about trying it? Bruce is a cutie. Fabulous card. So adorable I had to immediately purchase the stamp set and case your card. 🙂 My grandson will LOVE it!! I know I sure do!! Thanks for sharing your amazing talent!! Super cute! You really bring Bruce to life…and in such a fun happy way! Love your card. Bruce is so cute. So appreciate how you show us multiple ways to use a stamp set. Helps me get the bang for my buck. Fun card and great technique video. Love the idea of fooling the recipient LOL. 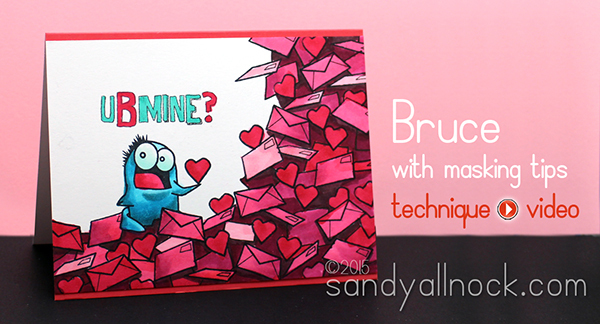 I will be your valentine Bruce!!! 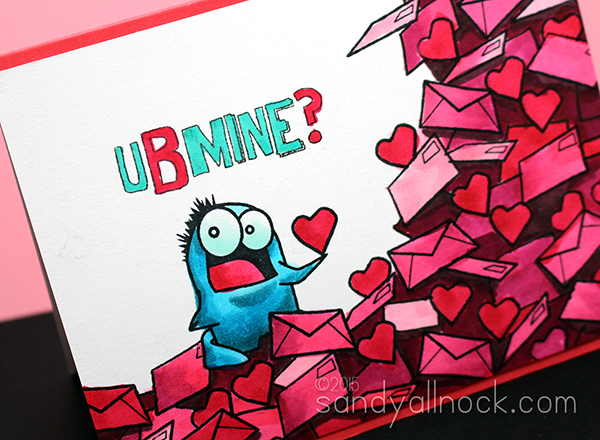 He is adorable and I just love the card! Thanks for sharing! Wow. Such a great card. Thanks for all the tips on how to not spend a bazillion hours coloring. Great video and fun card! Thanks.